If you don’t own a set of jump leads then not only will you have to find a person who is willing to help you, but you will also have to find a person who does have a set. When it comes to motoring, it’s best to be prepared so if you don’t have any jump leads, now is the time to get some. They can be bought online or from most petrol garages or reputable motor factors, and they probably won’t cost much more than £10. Place both vehicles as close as possible (without touching of course) and put them in neutral/park with the handbrake on. Turn off the ignition on both cars. Attach one of the red clips on to the positive terminal of the flat battery. 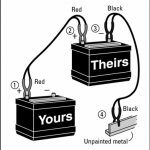 Many car batteries will have a red plastic cover on the positive terminal, otherwise it can be identified by a + or POS sign. Attach the other end of the red lead to the positive terminal of the working battery. Now that the cars and jump leads are in position you are ready to jump start the car. The first thing to do is start the engine of the car with the working battery. Leave the engine running for a few minutes. After 5 minutes or so, try to start your vehicle. If it doesn’t start, then make sure that both of the jump leads are connected correctly, and leave the working car engine running for a further five minutes. If after this time your car still won’t start, then there is likely to be a significant problem with he battery and it will need to be replaced. This is where your breakdown cover will come in handy. If your car now starts, you can disconnect the jump leads in reverse order. Be sure not to habitually turn of your car’s ignition, as your battery may not be sufficiently charged to start the car again. Drive around for at least fifteen minutes before attempting to turn off the ignition again. 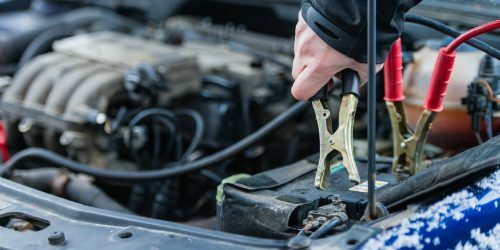 If your car battery is dead again the next time you try to start your car, then it means that your battery is unable to hold a charge and will need to be replaced.